Nahoko Kojima has been awarded a prestigious contemporary art commissioning award as part of Jerwood Makers Open 2013. She is one of five contemporary applied artists in the UK to be awarded the commission in 2013. The award “recognises rising stars in the world of applied arts” and is intended to give applied artists the opportunity to self-direct a project. The judging panel included Edward Barber, David Falkner and Bonnie Kemske. The new piece to be unveiled at the Jerwood Makers Open 2013 is entitled, Byaku, a Japanese word meaning White in English. It shall depict a life size swimming Polar Bear, hand cut using only one sheet of white Japanese Washi Paper and suspended as a free hanging sculpture. 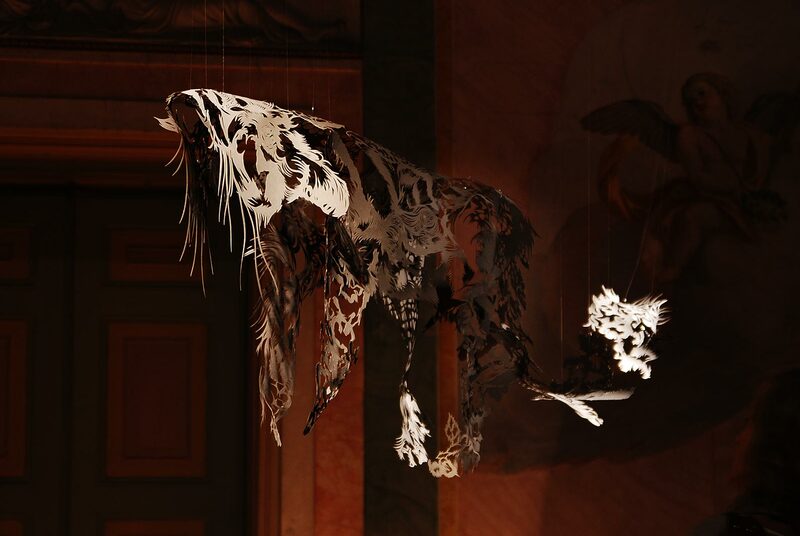 Nahoko Kojima has been commissioned to create her new sculptural papercut piece following the hugely successful Cloud Leopard which was unveiled at Saatchi Collect earlier this May and is now on a touring exhibition in Europe in partnership with Arte&Arte, Italy.